What Is the Art Print Publisher’s Role? Working with fine art print publishers can open up new sources of passive income for visual artists. Publishers represent fine artists and seek to sell their work to wholesalers and retailers. Besides sourcing artwork, art print publishers also design, art direct, print, market, sell, license and distribute fine art prints. Typically, art print publishers specialize. They either concentrate on open-edition prints, commonly called posters, or limited edition prints. Digital reproductions marketed as giclees are what most limited edition publishers market these days. Some print publishers are printmakers, or work with them to produce stone lithographs, serigraphs, monoprints, etchings and other such traditional art printing methods. Most works in these media are not reproductions. This post does not cover working with them. What we are concerned with here is the decorative art market. Making a Living in the Decorative Art Print Market. You can get your nose out of joint of the term “decorative market” if you want. That is a choice and potential financial problem for many artists with ill-conceived notions about what is art. The decorative market does not mean lesser art or lesser talent. It is work produced to sell at retail prices for mainstream buyers. It represents the vast majority of art sold worldwide. A rough guess is half the top selling works on Art.com’s bestseller list are old masters. Should we stop revering Picasso and Ansel Adams because their work is available to the masses? When reproductions of works by old masters are sold as posters, they are prime examples of decorative art. What Is the Art Print Publisher’s Market? Art print publishers who primarily market limited edition prints generally sell to galleries, direct to collectors, some wholesalers and interior designers. The average customer base of open edition/poster publishers consists of big box retailers, smaller chain stores, independent galleries, contract interior designers and international markets. What Kinds of Artists Do Art Print Publishers Seek? Art print publishers heavily invest in finding and developing talented artists. They search for artists whose work will sell well to their buyers. This typically means work that matches contemporary design trends. Sometimes they eschew trends to look for artworks they believe will have an enduring appeal to retail buyers, interior designers and home decorators. The Print Publisher’s Ideal Artist Wish List. Look for more details in next week’s post on what an art print publisher’s ideal artist wish list looks like. Subscribe here to make sure you get the scoop! Volume Buyers Drive the Decorative Art Market. Most print publishers have buying relationships with volume buyers known as “OEMs” in print market lingo. These buyers source bulk materials including prints, framing, glass and other materials used to fabricate finished work primarily destined for big box retailers and the mass market. They drive hard bargains on art prices. Their research strongly shapes art trends. A publisher may love your work, but if there is no mass market, they likely will pass on working with you. Art print publishers exhibit at art shows and trade shows around the globe to establish new relationships with wholesale buyers. Additionally, they market work to print retailers, interior designers (especially those who perform contract design for hotels, resorts, medical, and office buildings.) To promote their work, they produce digital and expensive print catalogs, and create elaborate websites to highlight the work of the artists in their stable. The Licensing Market Offers Extra Income. A large percentage of open edition art print publishers pursue placing work in the licensing market. For them and their artists it is an additional source of income. The licensing business repurposes prints for a wide range of use. Some examples are gift cards, stationery, calendars, linens, kitchen, bath, glassware, and much more. Some art print publishers license their artists’ works to big box retailers who exclusively sell the work in branded collections. 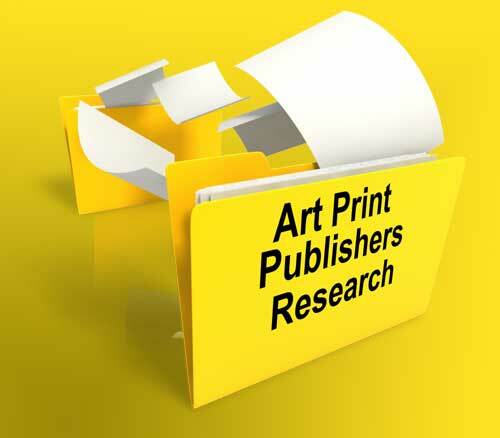 Sources to Find Art Print Publishers. The Internet is the most obvious place you can look. Using it it is tedious work. It requires patience and persistence. Still, if are enduring enough to wade through enough pages that result from search-terms such as art publisher, poster publisher, fine art publisher, giclée publishers, limited edition publishers and so forth; you will uncover hundreds of potential art print publishers to prospect. This is a great project for a virtual assistant. However you can, work to obtain show directories. Digital directories are the best. Otherwise, inquire if a hard copy is available. Show producers often use exhibitors lists and include show directories with promotion material for exhibit space. A show directory conveniently tells you the name of every company exhibiting and their contact information. Most do not include contact names, but should contain other necessary information to build your publisher database. While you may look for more resources than those listed here, it is probably not necessary. By using these resources, you can create an exhaustive list of potential art print publishers.